This is comprehensive agreement for the sale of purchase of a group of companies: two or more companies where one owns over 50% of the share capital of another. The structure of the group could be simple or complex. You may have a single parent company that directly owns all the other group companies, or there may be a more intricate ownership structure. The deal is for cash only. The parent and the subsidiaries could operate in any industry – which could be the same as each other, or varied. 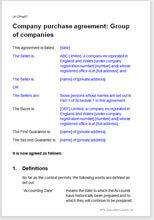 The document includes provisions and warranties if one or more of the companies own real property. This is an authoritative agreement with additional and different warranties specifically suitable for the purchase of a group. This document builds on our sale agreement for a single company by including additional provisions and warranties required if the subject of the purchase is a group – that is if the company owns a majority shareholding in one or more others. The size of the company, the composition of the group and the industries of the subsidiaries are not important to the document. The entity being acquired – the parent – may be a holding company for a large number of subsidiaries and associated companies in diverse industries, or there may be a wholly owned single subsidiary that exists in order to separate part of the group business from the parent. It is usually the buyer who produces the sale agreement since it is that party that takes most risk in the acquisition and who therefore needs greater protection. However, a seller could use this document, either as an aide-memoire during negotiations, or to gain advantage from preliminary editing. Warranties play a key role in the agreement. The buyer relies on the seller for information about the state of the group and the assets and liabilities in it. The seller agrees to stand by this information by warranting its truth. If it subsequently turns out to be false, the buyer can seek reparation for the damages. We include a draft disclosure letter that the seller can use to warrant information. Since the breadth of the information could be so great, we leave the letter brief but give a style to follow. The document covers real property – both those used by the businesses and those leased out. If the purchase is for some but not all of the shares, then a share sale agreement should be used. If just the assets of the business are being sold (such as those for an individual business unit), and not the shares, then a business sale and purchase agreement should be used.